!! NOW MOBILE FRIENDLY !! Staff notation links have been updated. with Search Capabilities,Music Links, Staff notation Links and English Translations of the lyrics. Please scroll down. রবীন্দ্রনাথ ঠাকুরের গান সম্পর্কিত তথ্যসমৃদ্ধ এক ওয়েব সাইট! Many songs of Rabindranath Tagore have been translated into English, some by Tagore himself, many others published in his lifetime with his approval. We have included as many of these translations in the lyrics pages as we could lay our hands on, along with the main lyrics and other data in Bengali, and, of course, pictures and portraits which know no language. A list of the links may be found by selecting below the English source book/ Translator. 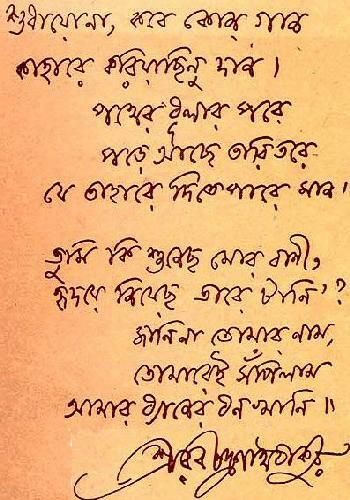 A phonetic transliteration of the first line of his original song in Bengali is provided along with the English version for the curious. The list sorted by Bengali alphabet is also available there. Staff notation links may now be found on the Lyrics and Data Page of the associated Song.